WordPress has become the first choice of bloggers, freelancers, and developers to build blogs, and different type of websites. WordPress gives you full control and it’s very flexible as well. Getting started with WordPress is a simple process, You can download and manually install it on your server, Use auto-installer or choose a managed WordPress hosting provider like Kinsta. You have multiple options for WordPress hosting. Shared hosting plans are cheap but they are not as secure and fast as managed hosting. In this article, I am going to review Kinsta. Kinsta is a managed WordPress hosting provider, powered by Google Cloud. Here are some of the main features of Kinsta. Kinsta team has designed it service with beginners in mind and packed with advanced features developers will love. You can start with a quick and simple install, or use their pro solutions right away. MyKinsta is the control center or Dashboard (as WordPress calls it) for your sites. From the MyKinsta Dashboard, You can do many things, from tracking bandwidth, visitor stats to creating SSL certificates, all the tools you need are in one convenient location. 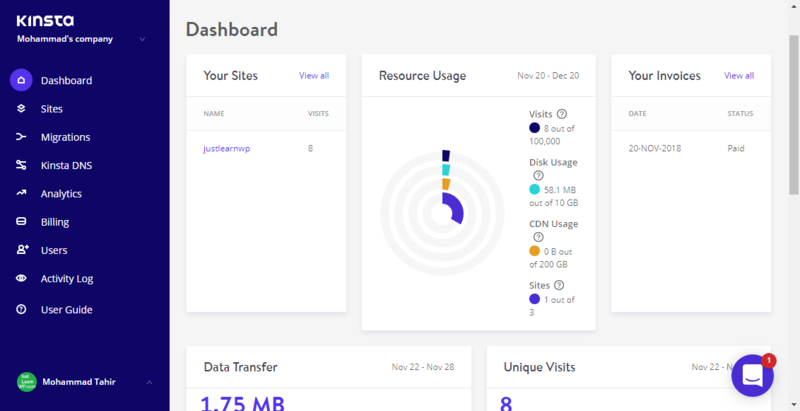 Kinsta dashboard lets you easily track important data for each of your sites separately; such as visitors, bandwidth usage, response times, and more. For the developers and team, Kinsta has a powerful multi-user feature that allows you to add any number of users to your team. Give them access to all your sites, just billing or add them as developers or administrators to a subset of your sites. Popular Kinsta clients: Here are few well-known and popular Kinsta users. If all these can trust Kinsta, You can too. Kinsta has different pricing plans for small bloggers and large enterprises. Starter plans cost $30 /month with 1 WordPress install, while ENTERPRISE 2 costs $900 / month which allows you to set up and manage 80 WordPress installs. 30 days money-back guarantee: If you are not satisfied with Kinsta, You get your money back. Backups: Automatic, manual, and system generated backups are stored for a minimum of 14-30 days. The retention period varies per plan. Limitations: The Starter plan does not support Multisite and Site cloning. Free SSL certificates: You don’t need to renew costly SSL certificates. Kinsta offers free one-click SSL for all plans with our Let’s Encrypt integration. You can also install your own certificate if required. Choose your data center: You get the option to choose one of the 18 Google Cloud Platform regional data centers for each of your sites. Staging areas: If you are a WordPress developer, You get access to the staging area for development, testing or tweaking, and tuning – all in a single click. Elasticsearch $100 / month/site: RESTful search and analytics engine capable of solving a growing number of use cases. Redis $100 / month/site: Open source, in-memory data structure store, used as a database, cache and message broker. Extra backups Every 6 hours $50 / month/site, Every hour $100 / month / site: For increased security and to recover even more stages of your website. Hourly backups are stored for 24 hours. High Traffic: If your post goes viral and you start receiving a lot of traffic, You pay only $1 per 1000 visits. CDN Overage: If you hit CDN limit, your site will keep running but Kinsta will charge only $0.10 per GB. Don’t let slow load times affect your business and Revenue. WooCommerce based online stores and eCommerce sites are dynamic and very demanding as they generate a lot of data, as well as un-cachable requests. This means you need a robust PHP, database, and caching solutions in place. It’s important when choosing WooCommerce hosting that you choose a container-based host that is built for automatic scaling to handle sudden surges in traffic and load. Revenue drops: Every 1-second delay in page load time decreases conversion rates by 7%. Bad UX: No one likes waiting for a site to load, which means fewer referrals and higher shopping cart abandonment. 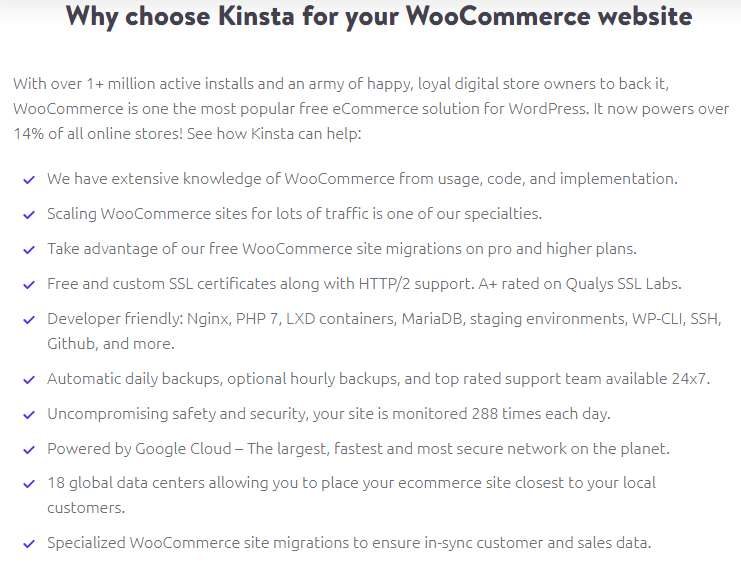 There are many reasons to use Kinsta for your WooCommerce based stores, See the screenshot above where Kinsta gives you many reasons to choose their hosting for your online stores. Visit Pricing Kinsta Plans page and sign up for a suitable plan for your needs. Complete your payment process and you will receive an email with login details. Now login to Kinsta Dashboard to create, and manage your website. Here you can see the screenshot of Kinsta Dashboard. On the lefthand side, you have the main menu with the following links. 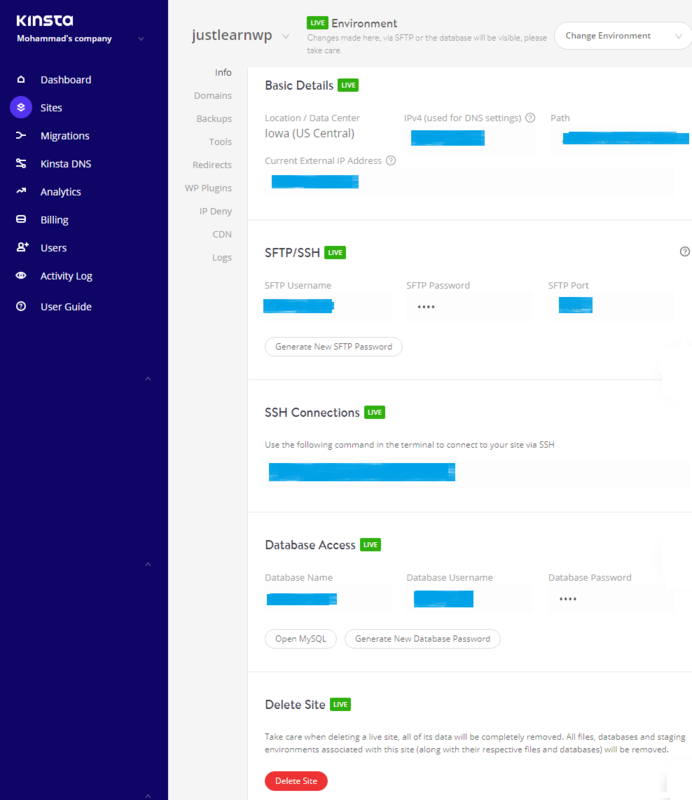 Kinsta DNS: is a premium DNS service provided free for their customers. It allows you to manage your own zone records and use Amazon Route 53 for a faster domain name resolving experience. Analytics: has Resources, CDN Usage, Dispersion, Performance, Response, Cache, Geo & IP settings. You can view total visits, page views, bandwidth usage, and other stats. Billing: Create invoices, update plans, payment method or billing details. Users: Add new users or change existing permissions. Each user can have access to the whole company or only specific sites. Go to Sites link in the sidebar menu and click on Add Site button. A pop-up form will appear. Type required information about your site. For the install mood, you have 3 options. Click the Blue Add button and Kinsta will set up a new site for you within a few seconds. 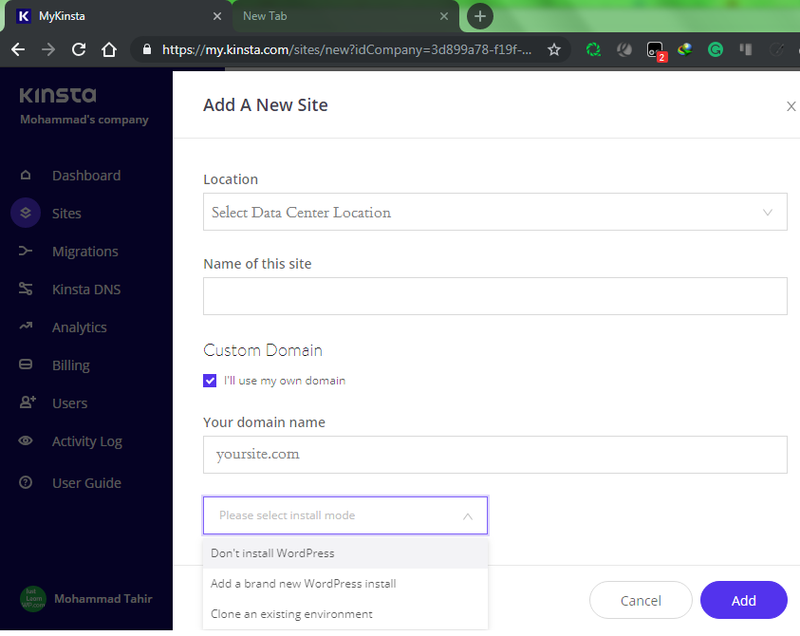 Note: Even though Kinsta gives you the option to create a new site without installing WordPress, but I could not find the option to install WordPress later on this blank site. On the Sites page, click on the name of any of your site and you will be redirected to the new site management page. From this page, you can manage everything about your site. You have the following options for site management. You can click on the Change Environment button to select Live or staging environment. Kinsta Dashboard has a clean interface and makes it simple and easy to manage all of your sites and users. If you have a lot of clients, Kinsta is a great option to host and manage your sites. Go ahead and Join Kinsta today or view all of Kinsta features before signing up for their plans.